Rotorua welcomes thousands of visitors every year in a very special Maori way. Two traditional pouwhenua (carved totem poles) stand guard either side of the Thermal Explorer Highway (SH-5) as you enter this attractive city. 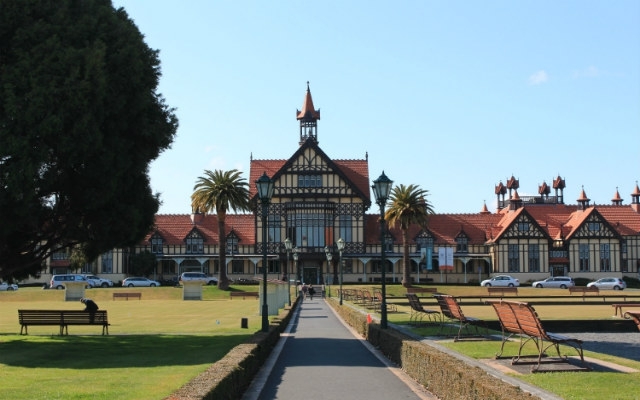 Located in the central North Island, Rotorua is frequently voted New Zealand's most beautiful city, and when you see the historic architecture, parks, lakes, cultural and geothermal attractions, you will understand why. Whether you arrive by car, hitchhike or on one of the regular intercity coaches that pull up outside the visitor centre, you fill find plenty of manmade and geothermal attractions that you don’t have to spend a fortune to enjoy. Rotorua has a whole district of backpacker hostels, and the healthy competition keeps standards high and prices reasonable. Four Canoes Hostel and Bar on Fenton Street is a geothermally heated hostel with a Maori-influenced interior, and makes a good base close to the town centre. If you’ve not found a great deal for accommodation online, head to the beautiful Visitor Centre and i-Site building on the corner of Fenton and Arawa Street. It’s worth pausing to take in the beauty of the Tudor-style building and clock tower before stepping inside. Once your backpack is stowed in your hostel locker, it's time to eat. Sue at Kingsize Burgers on the corner of Fenton and Pukuatua Street has been dishing up mega burgers for 32 years. Prices for a hot snack bag selection start at $6 while the ultimate Stag (steak, mushrooms, onions, egg and bacon) will fill you up for just over $10. Another place to look out for is the Gold Star Bakery, home of the award-winning Supreme Pie on Haupapa Street. Now you're ready to explore! The Rotorua Walkway is a 26km network of boardwalks and footpaths that links local historical sites, points of interest and geothermal attractions. Part of the walkway runs alongside Rotorua Lake, the largest of the 16 lakes in the area, with views of Mokoia Island. The Motutara section of the walkway passes through Sulphur Bay, a great place to see bubbling mud pools and steaming thermal springs along with local wildlife. Other sections take in historic battlegrounds at Te Arikiroa and the banks of the Puarenga Stream, where 7,000-year-old silicified trees can be seen. The walkway ends at Kuirau Park on the north side of Rotorua. 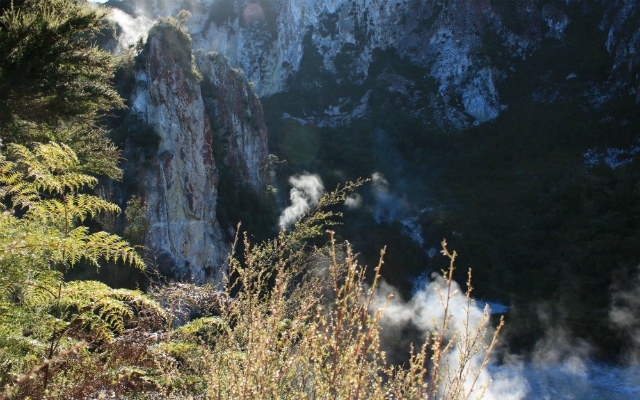 Kuirau Park is hard to miss from Ranolf Street as it emits huge amounts of steam. This free park has many active thermal attractions, in fenced areas. There are dozens of steaming vents and bubbling mud pools filled with chocolate-coloured mud and murky water. Stroll along the boardwalk to see the boiling Taokahu Lake with orange sulphur deposits beneath the steaming water. The lake is fed by a hot bubbling stream and rare plants such as Club Moss and Ring Fern, which only grow on heated soil, can be seen here. 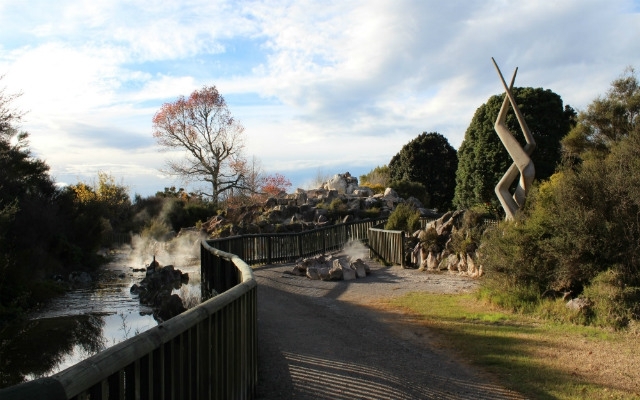 Rotorua is known for its dramatic thermal activity including hot geysers, mud pools and thermal springs. There are plenty of wonderful thermal parks in the area that charge for admission, but you can see many thermal attractions for free. The world-famous Pohutu Geyser is inside the Te Puia attraction. It frequently erupts 30m high into the air and can easily be seen and photographed from outside the park. Head out from Rotorua along Hwy 30 to the Silver Oaks Geyserland Hotel which overlooks the thermal park and the geyser which is directly behind. If you walk around the public car park at the back of the hotel you can clearly see the geyser spurting upwards and the steam drifting away on the wind. Rainbow Mountain Scenic Reserve is a geothermal landscape containing rare plant species and a striking coloured terrain. The reserve is 26 kilometres to the south-east of Rotorua and just off State Highway 5. The reserve features a couple of walking tracks to explore the terrain which includes a good viewing platform to take in the steaming coloured lake below. The entrance to the free Government Gardens in Rotorua is marked by an impressive trio of totara-wood arches made to resemble a royal crown. This gateway was erected for the 1901 visit of the Duke of Cornwall, later King George V. The gateway is surrounded by a Maori white carved fence and several beautifully carved pouwhenua. The botanical gardens are worth a stroll with a lily pond, various monuments and a rose garden. Peer into Rachel Pool with its clear blue waters boiling at a constant 212°F in the steaming crater. 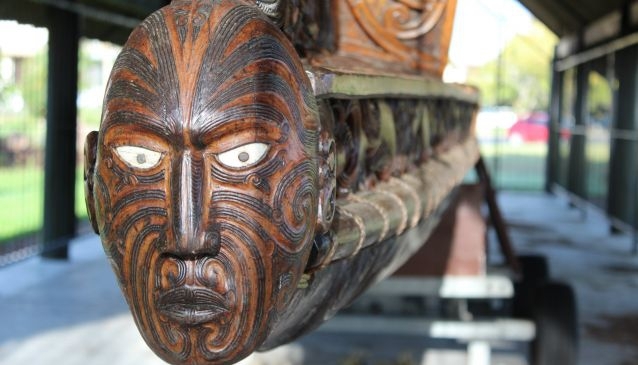 The walk along Memorial Drive from Government Gardens leads past the Te Arawa Waka Taua, a 20-metre ceremonial canoe beneath a decorative shelter. It is covered in decorative Maori carvings and paua shells. Further along is the stunning St Faith's Church, another Tudor-style red-and-cream building externally, but traditionally Maori within. Highlights are the Maori decorations, carved pews inset with paua shells and the etched glass window of Christ seemingly walking on the lake. 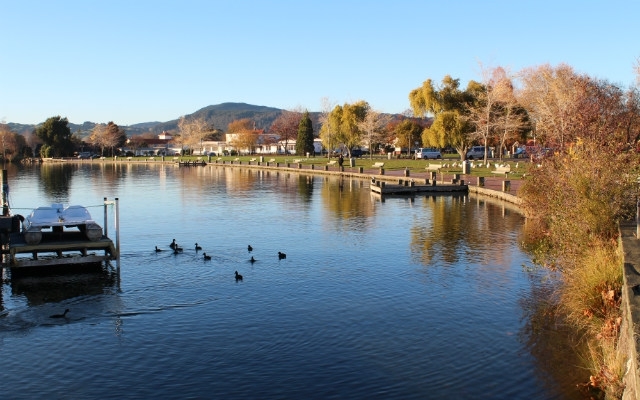 Admire the ornate Maori carvings and decorations on the nearby Marae (Meeting house), explore the white tombs of the Maori Cemetery and War Memorial and see more hot springs feeding into the lake. 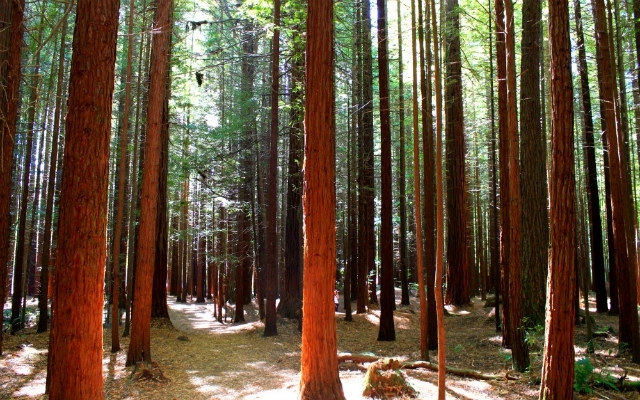 Around three kilometres from the city centre, Whakarewarewa Forest is absolute must free attraction. With over 170 species of trees, the dominant feature is the mighty Californian Redwoods that provide an impressive sight to walkers and joggers who flock here. The 288 hectare forest offer wonderful views of Lake Rotorua and Rotorua City. Walking tracks vary from two kilometres to a more challenging 34 kilometre tramp around the Blue and Green Lakes. Most tracks start from the Redwoods Gift Shop & Visitor Centre which offers information and maps on the area. With lakeside walks, ceremonial waka (canoes), spurting geysers and towering redwood trees, there are a host of wonderful ways to enjoy Rotorua without having to pay a penny.